A wealth of instant vocal processing power in an easy- to-use package - and all for a very reasonable price. A big thumbs up. High quality, versatile sounds. Flexible and very tweakable UI. Lacks the depth of some dedicated vocoder/talkbox/ tuning plug-ins. 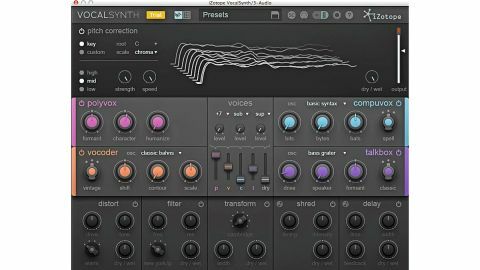 VocalSynth is a four-part vocal synthesizer and multi-effect processor which combines a range of corrective and creative tools within a single package. It is built around a quartet of modules each offering a different flavour of vocal synthesis effect: Vocoder, Talkbox, Polyvox - a vocal harmoniser and formant shifter - and Compuvox, which creates digitised speech synthesis sounds. These modules have been built with simplicity in mind. Each offers just three parameter rotaries plus a mode switch and preset drop-down in the case of everything except Polyvox. These four re-synthesis devices are fed by a global pitch/scale section controlled via the top part of the UI. VocalSynth has three operating modes - Auto, MIDI and SideChain - selected and controlled in this section. In the default Auto mode, the synthesis engines will select what notes to play based on an analysis of the main audio input. A Key selector allows users to define a specific set of notes, which comes stocked with a range of preset scale types, a custom mode for selecting user defined scales, and chromatic mode if you want to make all notes available. MIDI mode, meanwhile, takes its note information from a user-defined MIDI input, which can be switched between mono and poly modes. Finally, SideChain mode mutes the built-in synthesis engines in favour of an external carrier signal routed into a sidechain input, which is then modulated by the main modulator input. This global section also features built-in pitch correction, with range and speed controls for tailoring the effect to suit the incoming audio, along with a strength dial to adjust pitch correction. Generally, these pitch analysis and correction tools did a solid job in our tests - it's not going to replace something like Melodyne in your plug-in arsenal, but within the context of these kind of vocal effects it's reliable and flexible. Below the global controls sit the four main engines, laid out in that two-by-two grid around a central mixer. Positioned in the top left is Polyvox, the simplest of the four core modules with just three parameter controls - Formant, Character and Humanize. Essentially, Polyvox takes the main incoming audio signal and duplicates it, creating harmonies based on the melodic information coming from the global pitch section. As such - for creating harmonies at least - it's arguably best used in MIDI mode, allowing a simple monophonic vocal to be fleshed out into a full chord progression of voices. The three controls then alter the quality of the created voices. Formant shifts the formant pitch, creating an effect ranging from chipmunk-like squeaks to the sort of pitched-down sounds that are currently ubiquitous in chart House tracks. The Character control adjusts how much the new voices' formants are altered by their new pitch, while Humanize adds subtle pitch and timing variations to give the effect a more natural quality. Directly below Polyvox is the Vocoder. Here an Osc drop-down menu offers a choice of synth presets from the vocoder's wavetable engine (assuming there's no sidechain carrier signal overriding it). There's a nice range to the presets here, offering plenty of sounds well suited to classic vocoder effects, from the more subtle to the outright abrasive. The Vocoder also features a trio of parameter knobs: Shift, for altering the timbre of the resulting sound, Contour, which works like a simple EQ, and Scale, a control that alters how clearly vowel sounds are represented. There's also a mode switch, offering Vintage, Hard and Smooth characteristics, which add a nice extra layer of sonic variation. Compuvox is a vocal synthesis tool based around linear predictive coding. Again, an Osc menu offers a range of wavetable synthesis presets to act as the carrier signal. Here a trio of parameters labelled Bits, Bytes and Bats dial in digital aliasing artefacts, elongated vowels and a deep, gravelly quality respectively. Plus a mode selector offers Read, Spell and Math characteristics. Finally, Talkbox offers a range of wavetable patches - here more geared towards 'classic' instrument sounds. Of the three parameter rotaries, Drive and Speaker are fairly straightforward, offering classic overdrive and speaker emulation. Formant, meanwhile, adds a formant shifter to the module, which takes VocalSynth beyond the realms of traditional Talkbox sounds. Finally, a three-way mode selector offers Dark, Classic and Bright tonal variations. All four modules are impressive in isolation, but VocalSynth comes into its own with its ability to blend all the processors, along with the dry signal, via the central mixer. Fading modules in and out is a great tool for creating on-the-fly vocal interest. In this central section users can also control the polyphonic qualities of Auto mode. We're impressed with VocalSynth; it is simple, making classic sounds very easy to achieve, but there's a lot of depth once you start combining its elements, automating parameters and getting creative. We also tried the various modules on drums, synths and other instruments and ended up with plenty of unique, inspiring results. In short, there's a lot of sonic power here for a reasonable price, all in a well designed package.